One of my closest friends recently moved into a house across the street. She had been staying with me for a bit before, so we just carried her things across our little road, arms full of books, clothes and open boxes. Last weekend they had a housewarming. I made cake. As I mentioned in my post about Cider Caramel, Sautéed Apples and Cinnamon Ice Cream, there is an apple tree in my tiny garden. I finally harvested all of the remaining apples last week. I broke because the resident grey squirrel - Greg - started taking little nibbles out of apples while they were still on the tree, keeping mildly insolent eye contact with me as he left them bobbing on their branches, just like a child placing an incomplete apple back into the fruit bowl. Now I've picked them, he's moved onto the clusters of coral rosehips. Last weekend he even had a friend (I like to think it was a ladyfriend) perching next to him. They both watched through my kitchen windows as I cooked with my (/his?) apples, gobbling away on the rosehips clutched to their chests. 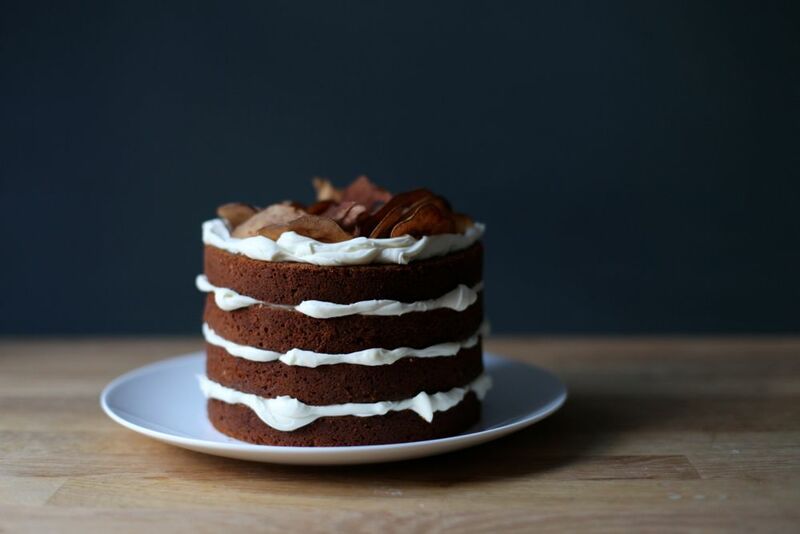 Though I've been trying to eat my harvest while they're still at their crisp, juicy best, my thoughts kept wandering to a carrot-cake-style apple cake. Late one night I had the idea of topping a layered cake with some apple crisps. I recently came across pear crisps for the first time and thought the concept would translate well. A few days before the party, I tried them out. I had some sugar syrup left from the Chocolate Pecan Krantz Cake, so I decided to try using a bit of that instead of sugar. I split the tray into four: sugar/cinnamon, sugar/plain, syrup/cinnamon and syrup/plain. The syrup/cinnamon quarter was the clear winner. 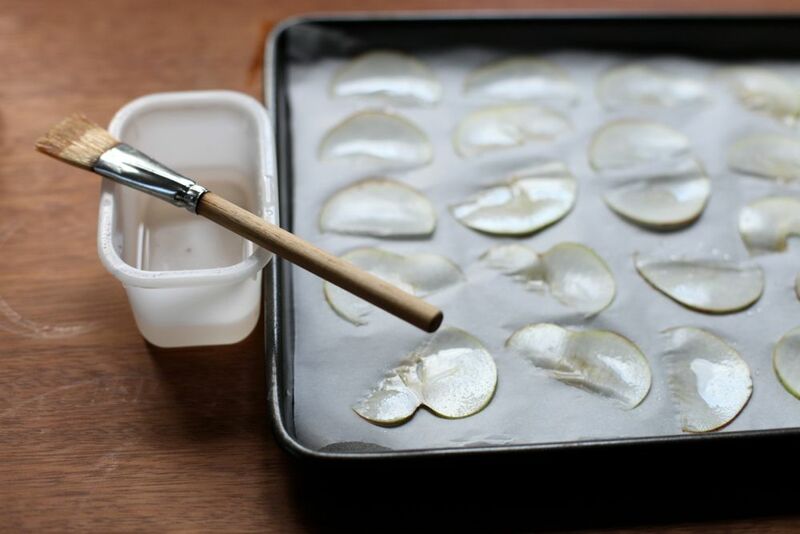 In the future I'd like to experiment with a few more things: slightly thicker slices (the pears were cut into 1/8" slices, mine were thinner - maybe that's how they got whole slices); brushing both sides of the slices with syrup and a few different oven times/temperatures. I decided on a mascarpone icing with just a touch of sugar and a little lemon to sharpen the edges. It's pure and you retain the delicate flavour of the mascarpone. I chose a simple carrot cake recipe from Nigel Slater to jump off from (it also happens to have a mascarpone icing, though it's much sweeter). One of my favourite things about this cake is the coconut oil. The mixture with brown sugar is almost as divine as it is with butter. It gives the cake a glorious smell, a certain smoothness on the tongue that's hard to describe and a delicate flavour that works beautifully with the mascarpone and apple. The cake is wonderful without icing and decoration too - I really enjoyed the plain test cakes I made. I'll probably make it more often that way, for simplicity and ease. Preheat the oven to 130C/270F for the crisps. Put the sugar and water into a small saucepan and heat until the sugar dissolves and it starts bubbling. Pour into a bowl to cool. Cut the apple in half, top to bottom, and remove the stalk. Use a mandolin to cut thin slices of the apple - I used my thinnest setting. Set the slices onto a parchment lined baking tray. Use a pastry brush to thinly coat the slices with some of the syrup. Sprinkle over a little cinnamon. Put the tray into the oven and bake for 30 minutes then turn the oven off and leave to cool inside. Remove from the oven and place into a sealed tin or box. To start the cakes, preheat the oven to 180C/350F. Grease two 6" cake tins and line the bottoms with baking parchment. Wipe a clean mixing bowl down with a piece of lemon (to remove any little bits of grease). Separate the eggs, putting the egg whites into the lemony bowl (to be whipped later) and the yolks into a cup/bowl. Sieve the flour, baking powder, cinnamon and sea salt onto a plate or bowl. Peel the apples then grate them - weigh and make sure you have 200g (don't add extra, it'll throw the liquid balance off). Put the coconut oil and brown sugar into the bowl of a stand mixer and beat on medium until fluffy and paler than before - about 4 minutes. Add the yolks one by one, beating well and scraping down in between each addition. Take off the machine and tip in the 200g of grated apple and the lemon juice. Fold together. Get your egg whites and whip them (I do this by hand because I think it's simpler, but you could transfer the apple mix to another bowl and very throughly clean the mixer bowl and use the machine, or use a hand beater) until they hold stiff peaks (be careful not to overdo it - a spike on the end of the beater should hold upright with a little waver - it won't be as firm as meringue). Fold half of the sieved dry ingredients into the apple mix, carefully but throughly, scraping the sides and bottom. Add half of the whipped egg whites and fold them in, followed by the rest of the flour, then the rest of the egg whites. It takes a little bit of patience but you need to get it evenly combined (no lumps of flour or big streaks of egg white) without losing too much air. Divide the mixture between the two tins, level, then form a dip in the middle. Bake for 40-45 minutes until domed, cracked, golden and a skewer comes out cleanly from the middle. Cool on a wire rack for 5 minutes then remove from the tin and leave to cool. When the oven has turned off and cooled down a little, I gave the crisps a crunch boost by leaving them in there for a few minutes. Make the icing as the cakes bake or cool. 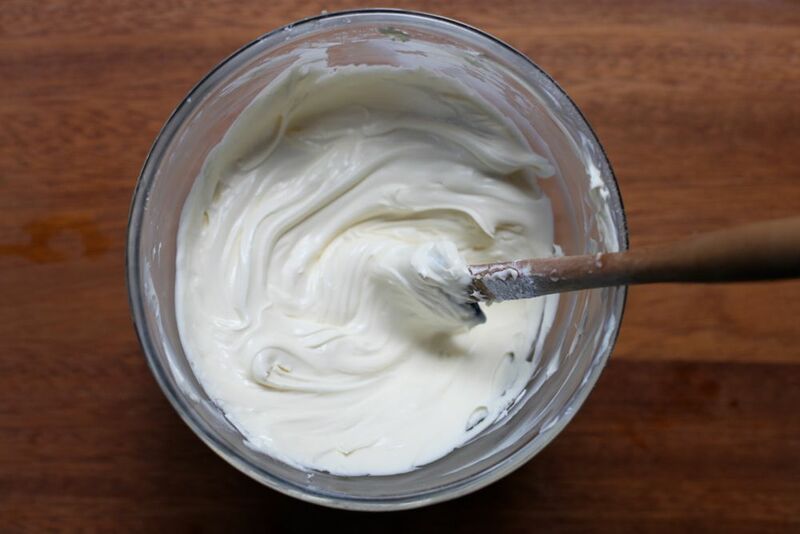 Place the mascarpone into a bowl and beat until smooth. Sieve over the icing sugar, pour in the lemon and beat again. Keep in the fridge until you need it. 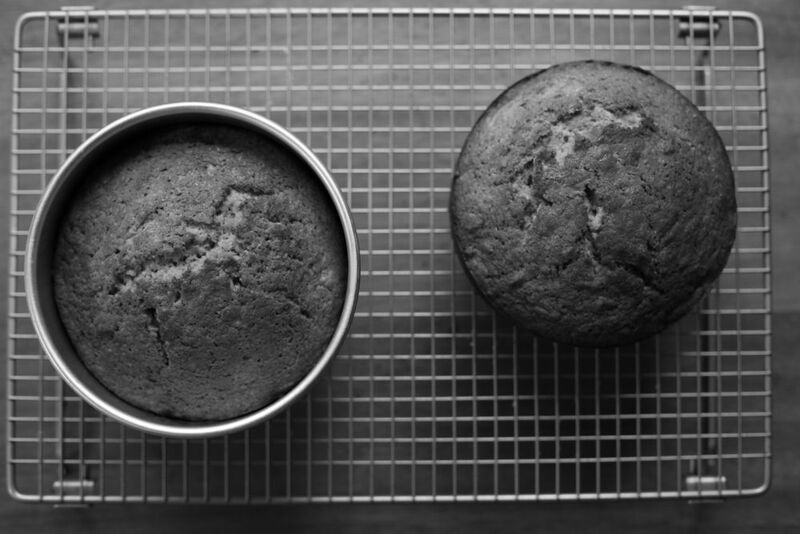 When the cakes are barely warm (or cold) you can start cutting - use a sharp serrated knife to cut the dome away from the top, trying to keep as flat as possible. Work out where the halfway line is on the remaining cake and carefully score all the way around with your knife, then go around cutting deeply to split the cake (this should help guide the knife so you get an even cut). Place one of the cakes onto a clean serving plate. Smooth over 1/4 of the icing, going right out and almost over the edge. Add the next layer and repeat until finished. Finally arrange the crisps on top. Best immediately, keeps assembled for a day in the fridge (will be quite different to fresh), plain cake for 3-4 days in a tin. What a stunning cake! I love everything about it from the apple crisps to the cake itself! Delicious! I'm new to your site (found you on Saveur). Lovely site...gorgeous photos...yummy recipes! You go girl!! Definitely making this cake. It sounds wonderful! I love all those apple crisps piled on top of the cake. It looks so natural & beautiful. 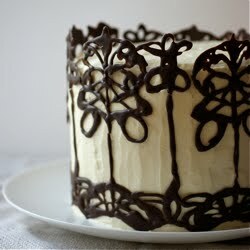 That cake is gorgeous - love all the layers and frosting bursting out of the seams. I've been wanting to try out those pear crisps too although you apple version looks as delicious, if not better. Emma, What a stunning cake! And that's so cool that you used coconut oil. Yum! Hope your studies and new house are treating you well! wow! this cake looks amazing! I love the idea of a bite of apple rather than more liquid as a filling! At first glance I would swear that cake was chocolate! But apples and mascarpone actually sound like a much more delicious (and seasonal) plan. Yay! I'll move in across the street, too. You are invited to the house warming party! What a gorgeous looking cake. I also switched to organic coconut oil. Loving it. Such a showstopper...who's game to make the first cut? I've been experimenting with apple chips too, and I've found dark brown sugar/cinnamon to work well for me. I also prefer to only have sugar on one side, since the chips tend to stick to the parchment if I sugar both sides of the slices. But now I'm curious: what made the syrup/cinnamon chips the winners? I bought coconut oil and I've never used it for anything as I didn't know what to do with it. I love the apple crisps on top - they really make the cake complete. Gorgeous cake! I love the apple crisps on top--what a great finishing touch. Also, your story about "Greg" the squirrel made me chuckle. Glad you were able to get some apples away from his clutches! Heya, I was just wondering where I can buy coconut oil from? If it's difficult to get hold of, is there a substitute? Hoping to make this amazing cake this weekend for my sister's return from uni! 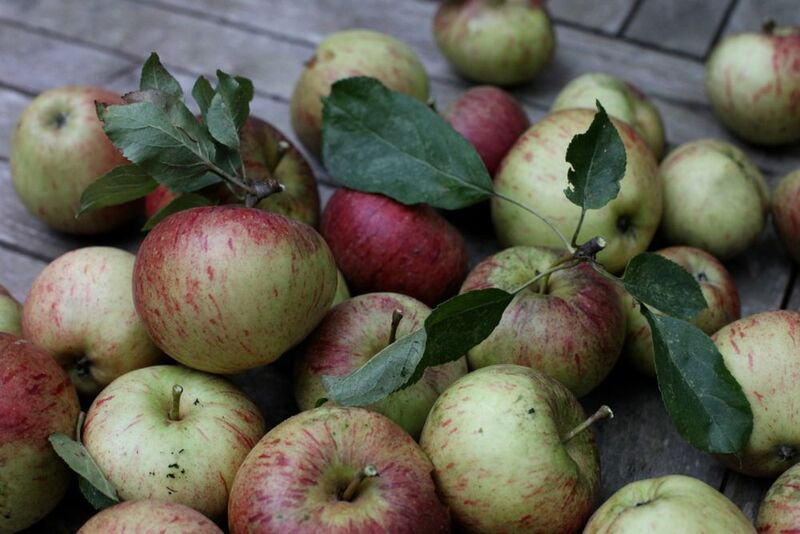 This one looks and sounds delicious, seasonal English apples are just the best at this time of year. Thanks for all the inspirational ideas, keep blogging! So beautiful! I love the apple chips on top! Love the sound of this! Looks great! This is such an incredibly beautiful cake! 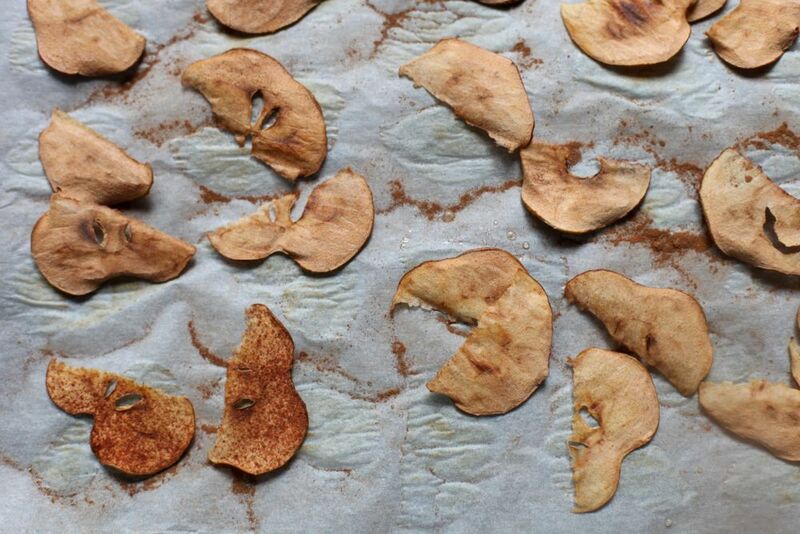 Love the idea of baking apple crisps. They look perfect on top of the cake. I've actually been thinking of using apple pulp (leftover from my new juice extractor) to make a cake. Hate the wastage really. Do you think it will work in this recipe? thanks! Yum, I want to try this out! Hello. What do you mean coconut oil, solid? I have noticed coconut oil in the supermarket but it's just oil. I don't get the solid issue. Whenever I've bought coconut oil it has been solid at room temperature. I am making it clear that you do not need to melt the coconut oil before using it. Hope that helps.